The Triton in general has a pointed spire. A spire is the coiled part of the gastropod; which usually extends to a point. As mentioned Tritons are gastropods (single shelled mollusk). A mollusk is the soft bodied animal living inside the Triton shell. They usually generate a calcius shell. 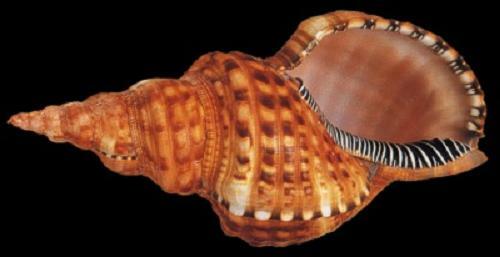 In this case a single shell (gastropod). Tritons are members of the snail family. Scientific name: Cymatiidae. In their case sea snails. They are carnivorous (meat eaters) dining on other mollusks and sea urchins. 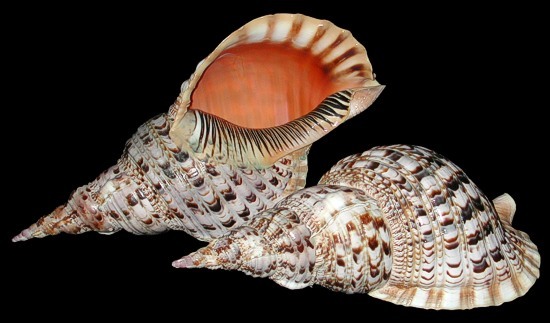 Native islanders used the Trumpet Triton shell as a musical instrument. That's how they became known as Trumpet Tritons. To make a Trumpet the natives cut part of the spire off. Our Pacific Tritons were caught off the Indonesian coast. Where as the Caribbean Tritons were caught near and around the Caribbean Sea. Most of our triton shells have a slightly blunted point. The Hairy Triton is a thick, strong shell. 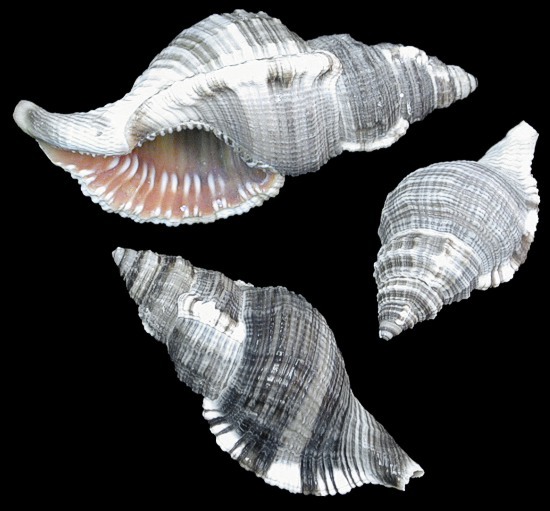 Its body is elongated with a slightly bent spire(the part of the body whorl(one complete turn of the tube of a gastropod shell(one shell animal)a round its imaginary axis)which usually tapers to a point. The Hairy Triton is white with broad dark brown bands. The aperture(opening of the shell) is reddish. Hairy Tritons when first captured are sometimes found with some hair growth. This disappears after a short time. Hairy Tritons are found in most tropical seas. The like to live in shallow water around coral. The Hairy Tritons we are offering are from the Indo-China Pacific region. Maple Leaf Triton shell. Scientific name: Gyrineum Perca. Type of shell Gastropod. It is a thick compressed and slightly distorted with a tall spire and moderately long siphonal canal. It has fin-like varices on each side of the whorls are drawn out into points. Each point being the termination ofa prominent rib. Spiral ribs crossing stronger vertical ribs produce vertical rows of nodules. Spiral riblets occur between occur between spiral ribs. The aperture is almost circular White, with brown spiral bands and blotches. The aperture is white. Habitat deep water, found across the Indo-Pacific region. Gold Triton is a common name for a Caribbean Triton. These are carnivorous gastropods. 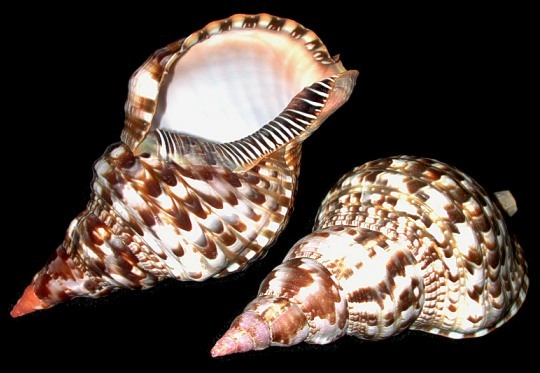 The picture shows the shell's natural color. Imported from the Turks without a scientific name. 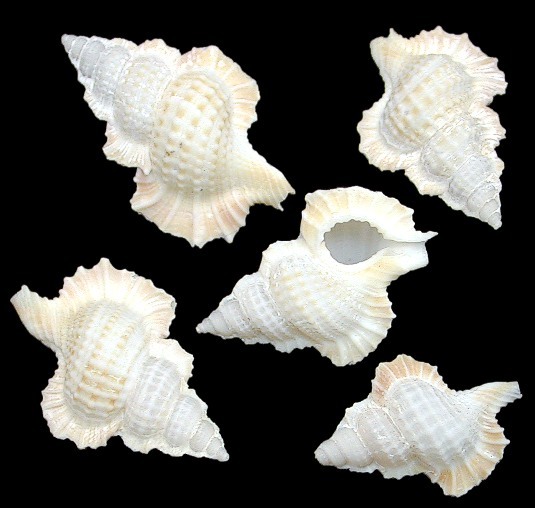 Shell tips are often blunted.